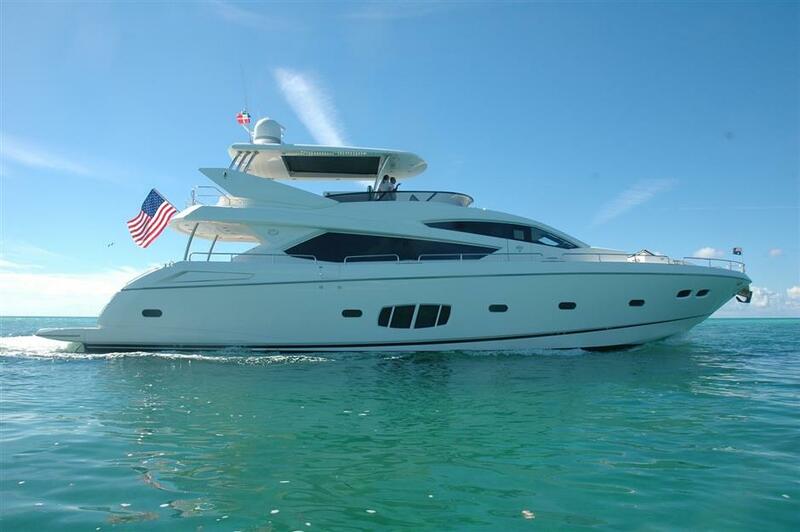 "Seas the Day" with this 80' Sunseeker 2010! US Flag - Duty Paid! : Atlantic Yacht & Ship, Inc. The 80′ Sunseeker is part of the “Yacht” series built from 2009-2014. She shares the same characteristics of her bigger siblings. Identically, higher bulwarks and zero speed fin stabilizers. Owner operations can be a practical reality with the 80′ Sunseeker designs. At sea, the 80 Yacht perfectly demonstrates the Sunseeker pedigree. Her soft riding through waves and agile turning ability with swift, precise return. After all, Sunseeker has earned a reputation of exceptional quality and performance. The 80 yacht is admired at each angle by everyone who crosses her path. “Seas the Day,” is a U.S. registered vessel with duty paid! In summary, a few of her most desirable features include Trac stabilizers, FLIR Nightvision, GOST monitoring, watermaker and a hydraulic passerelle. 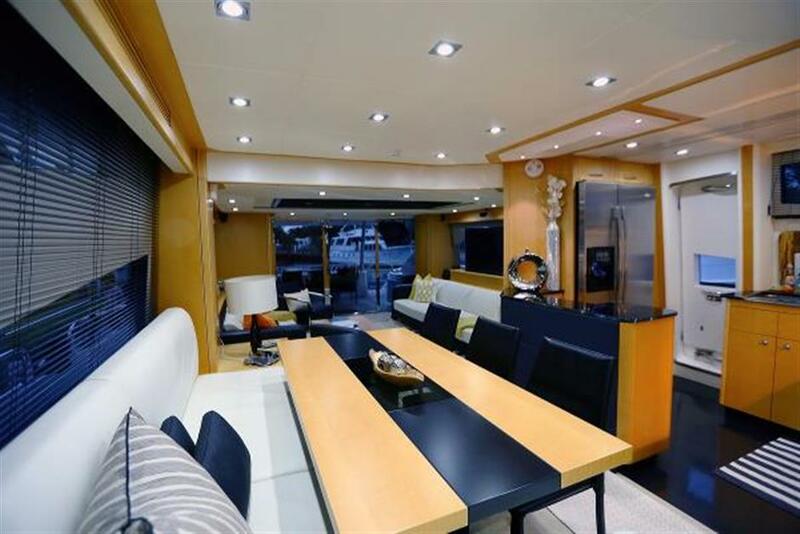 The interior of this yacht is spacious and full of natural light. Enter the salon through stainless steel framed sliding doors. The interior is contemporary with white and black sofas and a splash of color through accessories. The 52′ Sony TV connects to the fall and rise system for easy out of sight storage. Moving forward to the galley, an L shaped sofa and dinette area with 3 free standing dining chairs. Located across the dinette is the semi-enclosed galley. In light of the galley appliances, the stainless steel refrigerator, electric multi function oven and full size dishwasher are upgrades. The helm operates with a Furuno Navnet 3D Dual MFBB system. 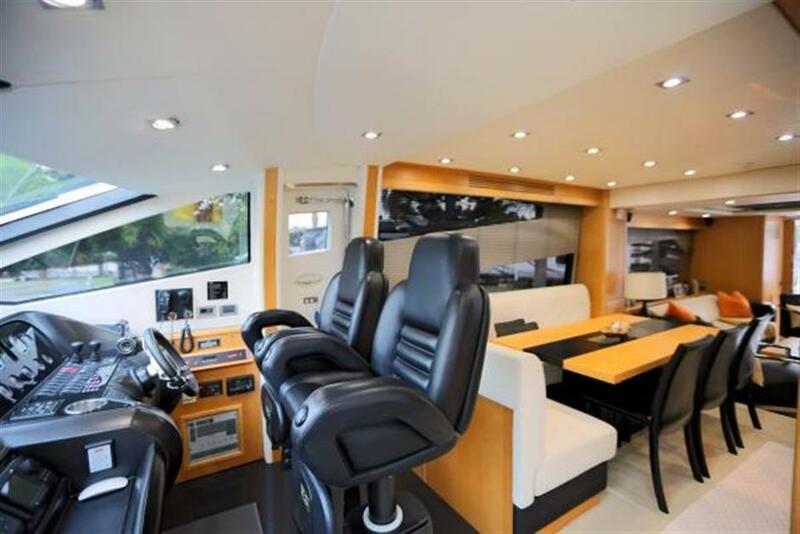 Additionally, there is a keyboard at helm as well as the flybridge. The CCTV Camera system is linked to the Furuno displays on the flybridge and main helm along with all TV’s on the boat. Enjoy the view from the bow cockpit with seating at the lounge sofa or sun pads. As shown above, the sun pads have adjustable folding positions for comfort. All exterior seats and sunbathing cushions are made with reticulated foam. All cushions are Sunbrella water shedding fabric. Correspondingly, covers are not necessary for the exterior cushions. 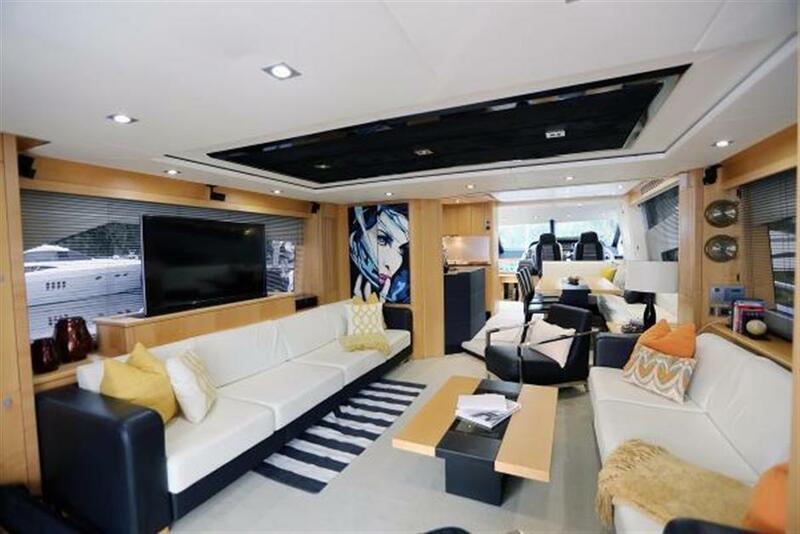 The main attraction of this 80′ Sunseeker is her flybridge and versatile space. Equipped with an upgraded GRP hardtop, including a black retractable center canopy. Not only does the flybridge have a spa tub, but also has its own water heater, custom padded top and teak step. Enjoy easy cooking and entertaining with a Gaggenau BBQ grill and additional refrigerator upgrades. 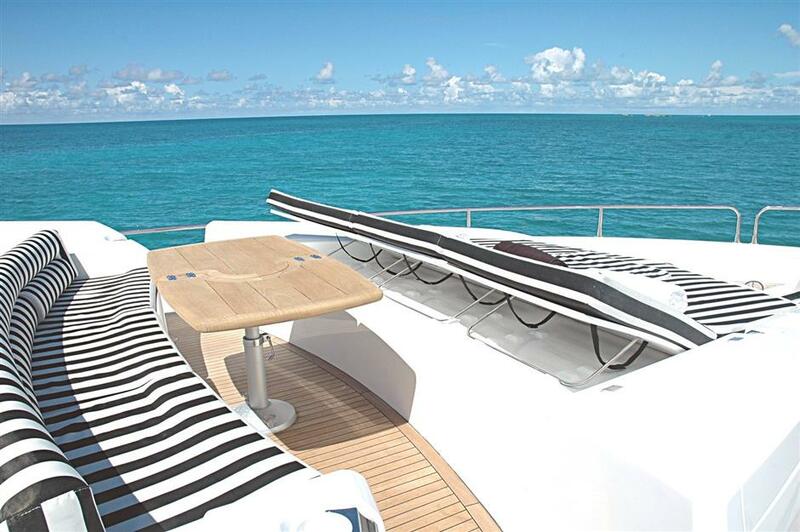 Furthermore, there is plenty of seating options available for guests across the entire flybridge. For more information about the 80′ Sunseeker “Seas the Day,” please contact the Atlantic Yacht & Ship sales professional Stephen Faraldo at 561-322-8279. The 38′ Fairline Targa 2014 is a fully equipped pocket cruiser! 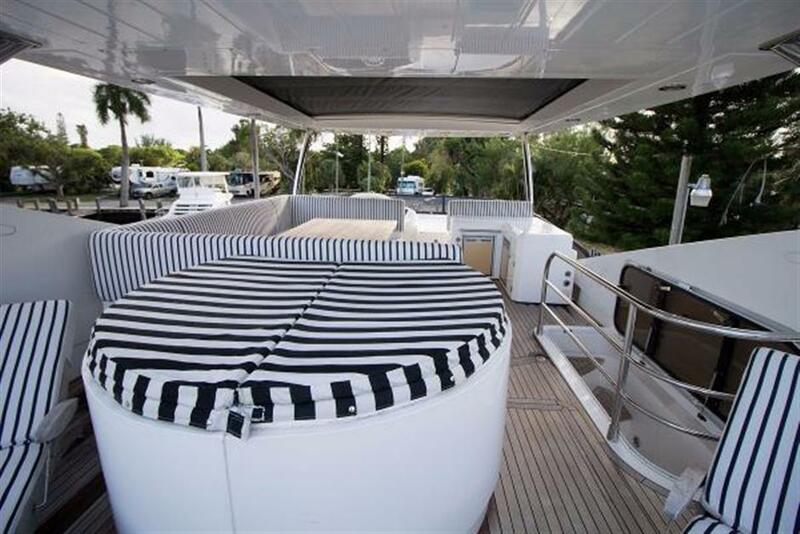 “Long Aweighted,” your great escape awaits you on the 116′ Lazzara 2008!